Transport to the brain is important for drugs that have their site of action in the brain compartment. 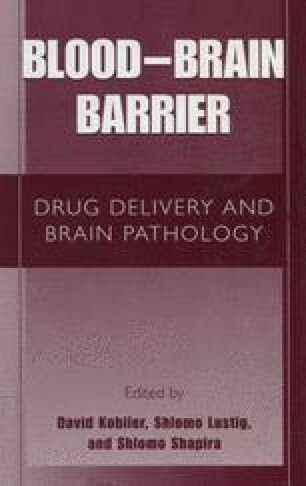 However, drug transport to the brain is limited by the presence of various barriers in the brain. These comprise the blood-brain barrier (BBB), the blood-cerebro-spinal-fluid barrier (blood-CSF) presented by the choroid plexi, and the brain-CSF (brain-CSF) barrier presented by an epithelial layer (ependyma) covering the circum-ventricular organs (CVO’s). The BBB and the blood-CSF barrier limit the entry of drugs from blood into the brain and the CSF respectively. However, since the surface area of the BBB is about 5000 times larger than the blood-CSF barrier, it is in this context considered as the most important barrier to the brain. It can be considered as a physical, a metabolic and an immunological barrier whose properties are changed during disease (stress) conditions. This may result in increased or decreased paracellular and/or transcellular transport of compounds to the brain. Under such conditions, upregulated transcellular transport may provide a key to target drugs selectively to the BBB and subsequently into the brain. In the BBB Research Group of the Division of Pharmacology, the PK-PD of drug transport to the brain is studied, at the level of the BBB. This comprises the study of the kinetics of drug transport and the effect(s) of disease on drug transport to the brain (Fig. 1).